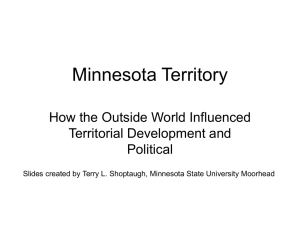 The territorial era of Minnesota covers the history of the land that is now the modern US state of Minnesota from the Louisiana Purchase in 1803, to its achieving statehood in 1858. The Minnesota Territory itself was formed only in 1849 but the area had a rich history well before this. Though there was a long history of European presence in the area before 19th century, it was during the 19th century that the United States began to establish a firm presence in what would become Minnesota.Many of the facets of Minnesota culture that are perceived as the area's early history in fact originated after this period. Notably, the heavy Scandinavian immigration for which the state is known, and the pioneering days chronicled by author Laura Ingalls Wilder occurred after statehood in the later 19th century. Unlike these later years, the first half of the 19th century was characterized by sparsely populated communities, harsh living conditions, and to some degree, lawlessness. This era was a period of economic transition. The dominant enterprise in the area since the 17th century had been the fur trade. The Dakota Sioux, and later the Ojibwe, tribes hunted and gathered pelts trading with French, British, and later American traders at Grand Portage, Mendota, and other sites. This trade gradually declined during the early 19th century as demand for furs in Europe diminished. The lumber industry grew rapidly, replacing furs as the key economic resource. Grain production began to develop late during this time as an emerging economic basis as well. Saw mills, and later grain mills, around Fort Snelling and Saint Anthony Falls in east-central Minnesota became magnets for development. By the end of the era east-central Minnesota had replaced northern Minnesota as the economic center of the area.This era was also as a period of cultural transition. At the time the U.S. took possession of the region, Native Americans were by far the largest ethnic groups. Their role in the fur trade gave them a steady stream of income and significant political influence even as the French, British, and Americans asserted territorial claims on the area. French and British traders had mixed with native society in the area for many decades peacefully contributing to the society and creating new ethnic groups consisting of mixed-race peoples. As the Americans established outposts in the area and the fur trade declined, the dynamics changed dramatically. The economic influence of the Native Americans diminished and American territorial ideology increasingly sought to limit their influence. Large waves of immigration in the 1850s very suddenly changed the demographics so that within a few years the population shifted from predominantly native to predominantly people of European descent. The native and mixed-race populations continued to influence the territory's culture and politics, even at the end of the territorial era, though by the time statehood was achieved that influence was in steep decline. Heavy immigration from New England and New York led to Minnesota's being labeled the ""New England of the West"".